Why go through a stressful and backbreaking removal in Wandsworth, when you can go through an easy one. You can do that by allowing us to organise and carry out your upcoming residential or commercial relocation. We from Sky Removals are experienced and fully certified movers and we have an innumerable account of successful moving projects behind our backs. We are credited to be the most reliable removalcontractors in the borough due to the fact that we have a 100% completion ratio and always work in full transparency. So, know that by choosing to work with us, you are opting to benefit from the best removal services in Wandsworth, SW.
We have the necessary manpower and technical capacity to handle all types of property removals in Wandsworth. We have handpicked our crew of packers, carriers and drivers via our strict employment polity. We screen thoroughly all our workers because we firmly believe in the saying that a company is only as good as its employees. To us it doesn’t matter whether we have to relocate a small studio, mid-sized office or large ancestral mansion because we have the resources to carry out all jobs quickly, smoothly and without any complications. Also don’t worry about your tight deadline because we promise you that we will meet it. Even more, if necessary we will walk the extra mile and work round the clock if your business or domestic removal in Wandsworth, SW, requires it. 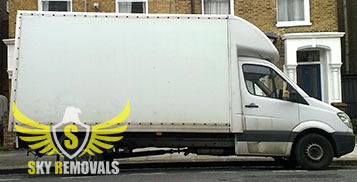 To our knowledge we from Sky Removals are the contractors that provide the largest array of standalone services in the borough and one of our most praised and sought after options is our furniture delivery service in Wandsworth. We have a large fleet of clean and new moving vans and a team of well-trained man with van technicians, so rest assured that we can haul all types of furnishings. Even more, our employees will gladly lend you a hand with the assembly of your new furniture if you aren’t feeling up to the task or you don’t have the necessary time to do it on your own. Keep in mind that we maintain nationwide coverage which means that we can bring to you your furnishings anywhere within the United Kingdom. Our polite and friendly phone operators will gladly provide you more details about our Wandsworth furniture delivery services and more importantly present you your non-binding personalised free service quote. The only types of junk that we cannot remove for you are hazardous rubbish such as chemical and toxic waste. 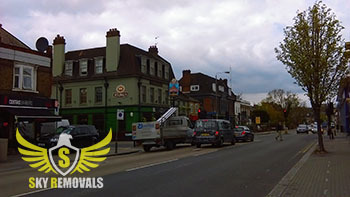 We also provide contract rubbish removals in Wandsworth, SW, which can solve all your waste management duties. We work with a flexible schedule which makes booking our services extremely easy and more importantly which means that we will come and collect your junk at a periodic basis that best suits your personal agenda and preferences. We can also rent you one or several or our skips if you are having garbage stores issues. Our bins range from extra small to extra large and can be provided with a cover if necessary. All our skips have been inspected by the local authorities and have been deemed safe for the keeping of the aforementioned types of rubbish. Know that we provide all our services including our waste clearances in Wandsworth at highly affordable prices. Expensive item relocation We have the assets to easily and flawlessly move expensive and delicate objects such as artwork, vintage items, musical instrument, jewellery and etc. 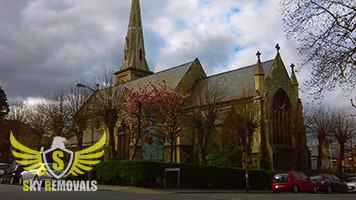 Our company is based in the London Borough of Wandsworth, SW. The area lies in the western parts of the city and has an estimate population of 312.000 people. It is served by numerous railway and tube stations, including the renowned Clapham Junction Railway Station which is one of the busiest in the English capital as it provide transportation services to also 30 million people on an annual basis. It was opened in 1863 and serves both the London Overground and the National Railway Network. In the upcoming years the station will commence to serve the Crossrail and underground networks as well. The Battersea Arts Centre is perhaps the most famous landmark of the Borough of Wandsworth. It is located in close proximity to the above mentioned Clapham Junction Railway Station and is one of the city’s most visited performance venues. The theatre was opened in 1980 and is housed in the 19th century edifice which was designed by the renowned English architect Edward William Mountford. The building is recognised as a Grade II* structure while the venue has two halls with a combined capacity of 640 seats (140 seats in the Lower Hall and 500 seats in the Grand Hall). Battersea Park is an open space in Wandsworth, SW, and is another well-known place of interest. It was created in 1858 and covers an area of 200 acres. It main feature is the Peace Pagoda which was unveiled during the mid-1980s. It is also home to the War Memorial of the 24th Division which was erected in 1924 and created by Eric Kennington. Wandsworth Common is another popular green space that is part of the borough.